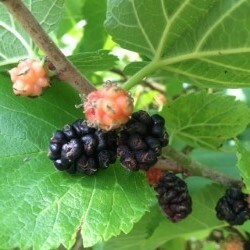 Finally the Mulberry bush we planted at Twee HQ is full of Mulberries 8 years after it was planted! It's been a long wait but now it means... mulberry jam time! I love making a new flavoured jam that I have not tried before, a real adventure... and wow what a flavour! If you would like to try some Twee Mulberry jam click on the shop page or look at the events page to see where Twee is having a stall near you.